Carolina Mornings Cabins and Vacation Rentals is Western North Carolina’s leading vacation rental company! Founded in 1997 by our owner, Shari, Carolina Mornings has spent over 20 years hand-picking the best accommodations for travelers wanting to experience the best parts of the Blue Ridge Mountains. We offer a wide selection of properties from romantic and cozy cabins-for-two up to expansive lodges and estates that accommodate family reunions and corporate retreats! 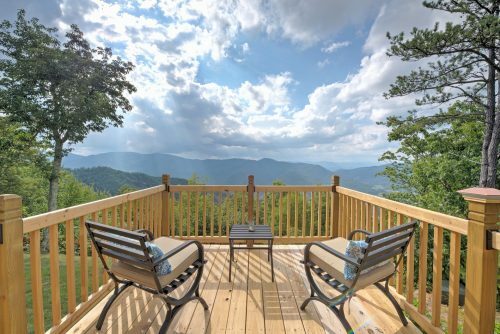 Whether you want to stay in town or on a mountaintop, we’re sure to have the perfect rental for you. Our cabins and vacation homes offer the best amenities that you’re looking for: Hot tubs, mountain views, fireplaces, game tables, all linens and towels included, professional service and maintenance, and a large selection of pet-friendly properties. We accept online bookings 24/7 on our website and are also standing by to help you on the phone. We also have many properties that offer “First Dog Free” for our furry travelers! Save money when traveling with Fido by staying with us. We are a LOCAL COMPANY that lives in our community! We’ll help you find the best things to do in the area. Need a suggestion? No problem! We are all super excited about the area and love sharing our favorite spots with visitors. We are LIVING WAGE CERTIFIED and we take care of our employees! Our team takes great pride in our services, and our guests love the extra attention they get. We GIVE TO CHARITY in town, in the region, and across the globe! Ask about our Stay For Good charitable giving program. You’ll help others while having a great time when staying with Carolina Mornings. Simply give us a call or visit our website today! We hope to hear from you soon, and we look forward to hosting you!! !